NEW YORK — As Danielle Bayard Jackson was putting together her birthing team, she made sure to include a doula, all the details she wanted taken care of during delivery and how bright the lights should be for ambiance. She passed on the makeup artist. With the Kate Middleton postpartum hair blowout (three times!) fresh in our minds and another royal birth upcoming, the debate over perfection hours after giving birth looms large for some women. 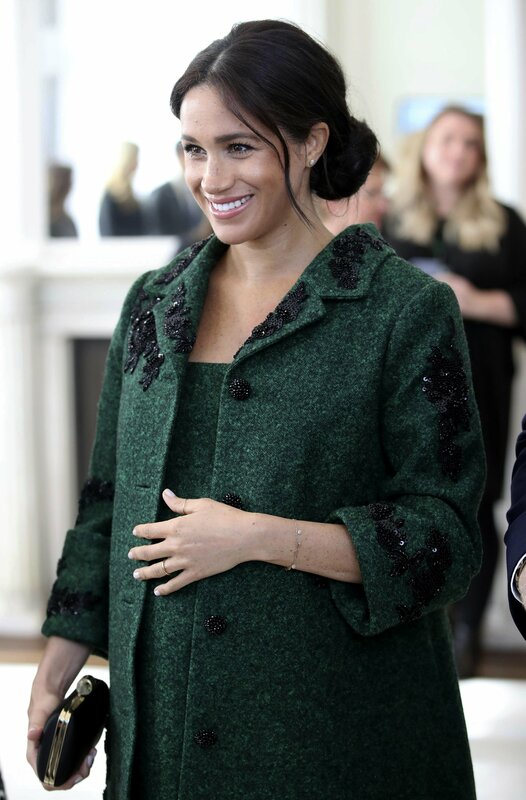 While we won’t know whether Meghan, the Duchess of Sussex, will follow in the footsteps of Kate, the Duchess of Cambridge, when it comes to postpartum perfection, we have an inkling Meghan will at least slap on some makeup as she introduces the latest royal to the world next month. And when she does, anti-glammers will take notice. But, no judgments of those who choose to spruce up. With some hospitals providing in-house spa services and plenty of women hiring specialists for hair, makeup and nails, the argument over what makes a postpartum mom feel best cuts both ways. For Julien Farel’s wife, it meant pulling her look together to greet visitors — including her Old World British grandmother — after the arrivals of their two children. Farel owns the Julien Farel Restore Salon and Spa inside the Loews Regency Hotel on New York’s swanky Park Avenue. He’s been providing and arranging for in-hospital services for women giving birth since 2001, with prices now ranging from $320 for a blow out, makeup or manicure to $2,000 an hour for all three at the highest level of design and expertise. Farel has between 10 and 15 in-hospital pregnancy clients a month among his usual customers. Brenda Kosciuk, outside Scranton, Pennsylvania, took matters into her own hands for the birth of her second child, now 3. Still the hashtag “takebackpostpartum” is alive and well on Instagram. “Women are more confidently owning their bodies, not feeling obliged to always look good and social media ready after giving birth,” said Marianne Ryan, a New York physical therapist who focuses on pregnant and post-baby bodies. Jill Simonian, who — ironically — wrote a book titled “The FAB Mom’s Guide: How to Get Over the Bump & Bounce Back Fast After Baby,” said all the social-media-fueled doubt among new mothers isn’t good for mom or baby. “If you want a blowout to make yourself feel better a few days after having a baby, go for it! It’s the constant posting, showing, sharing that drives me absolutely nuts and indicates a sure fire, unhealthy start to new motherhood,” she said. Simonian supports a 30-day hiatus from all things glam after giving birth.